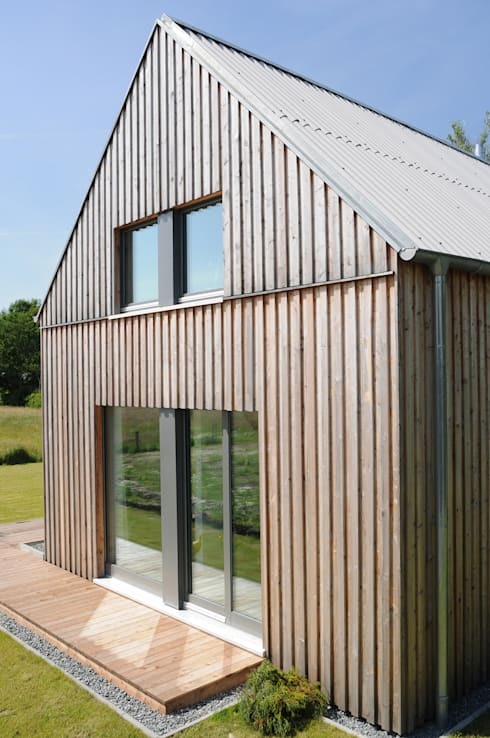 This down-to-Earth wooden frame construction was designed by architects from Jebens Schoof Architekten as a high efficiency house and executed with a correspondingly high-insulation building envelope. Together with their client, these architects embraced an innovative housing concept in both the unique floor plan and an unexpectedly open building exterior. With a blend of rustic and industrial elements, this family home emits a sense of establishment, grounding, and connection to nature. The home's location on the edge of town only serves to heighten the appeal of the design, which draws upon both rustic and urban industrial elements. 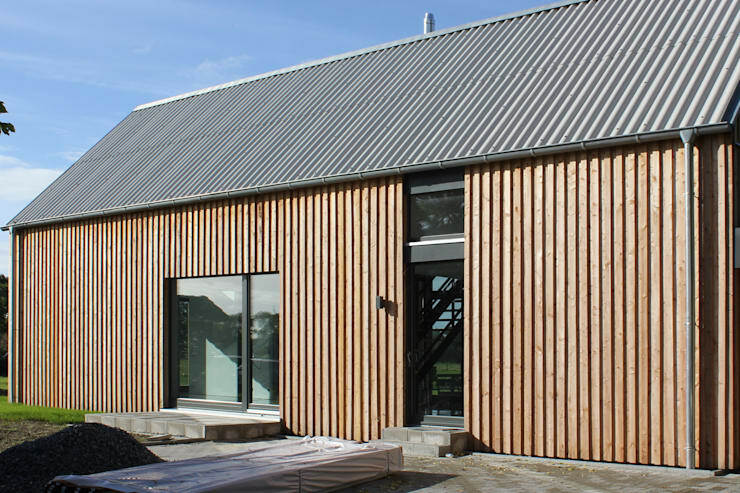 Although the logical, barn-like shape of the home is a traditional and simple shape, there's a wealth of detail and complexity in this exterior design as well. 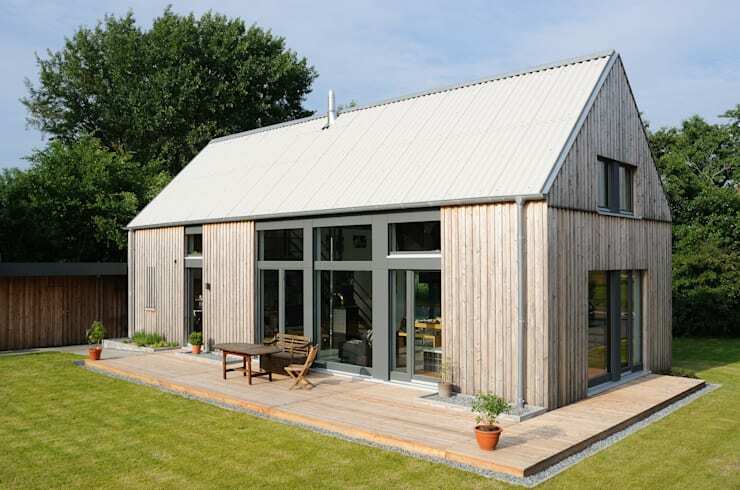 The classic saddle roof is made of a light-grey fiber cement cover that harmonizes with the facade and provides a light, bright surface where you'd often expect to see dark browns and greys. The construction maintains a strong emphasis on effortless connection with the outdoors. This side window slides aside to give easy access to the boardwalk, which effectively ties the home together and provides a grounding link to the grassy yard beyond. A closer look reveals how strong, straight lines figure prominently in the aesthetic of the home. Drawing the eye in an energetic vertical direction, the wooden planks on the side of the home take on an added sense of strength and height. Even the doorway has been design to emphasize the elongated, rectilinear forms present in the exterior, with the doorway cutting a rectangular slice out of the siding from doorstep to gutter. The builders' desire was to create a large living and dining area with direct access to private rooms. They achieved this with the barn-like shape serving as the shell, which floats spaciously around the development of a central open-concept living room and dining area. In fact, the architects have been able to eliminate any load-bearing walls on the ground floor, except for the walls that comprise the outer shell, of course. 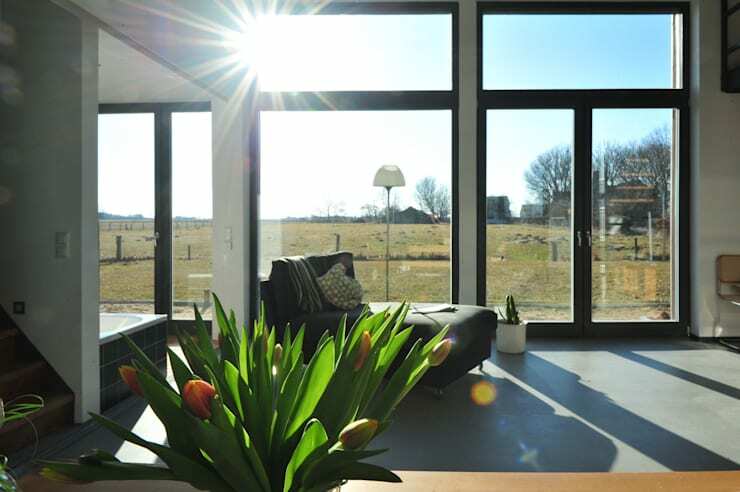 An open-sided home has many benefits, and one is the ample supply of natural light in the home. Not only does this transparent facade enjoy panoramic views, but the living room receives a generous sunbath that establishes a harmonious daily rhythm with nature. This view shows how the many rooms of the home enjoy direct, obstruction-free access to the central living area, with an open loft above and a bathroom and bedroom below. 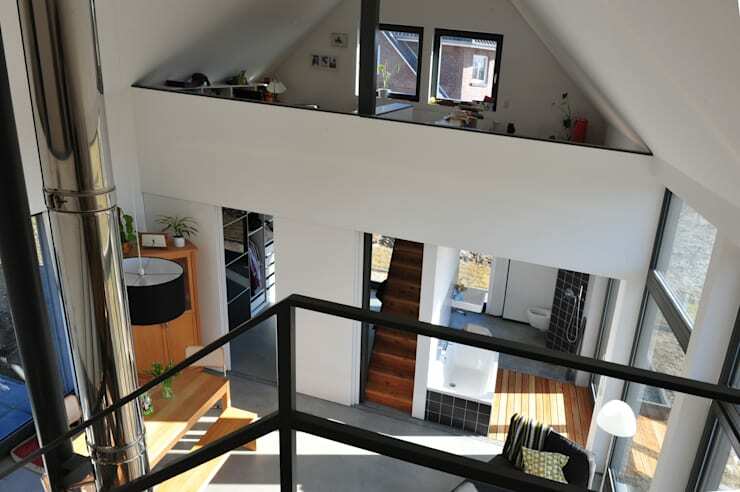 A unique feature in this design is it's mobility: the white walls can slide along tracks in order to give privacy to the bathroom, staircase, or bedroom. Intrigued by this high-mobility design? Have a look at this ideabook with 12 examples of terrific sliding door designs! All around, there are hints of industrial aesthetic. 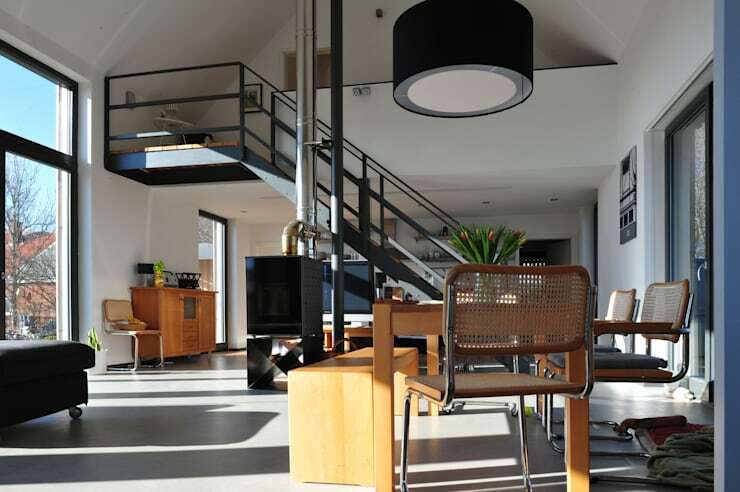 Most notably, a steel chimney reaches proudly through the center of the room. Your eyes are also met with a sturdy black metal railing and a steely grey floor. This edgy industrial look is balanced with soft wooden materials in the furniture and the rustic undertones in the wicker chairs at the dining room table. What do you think of this modern rustic home? Comment below!